The automotive industry is booming and everyday people purchase new cars and sell their old. That’s why roadside assistance and vehicle breakdown recovery services are now become more trending in Calgary, Alberta area. Whether you are experienced in driving, a vehicle breakdown may occur anytime and anywhere. Roadside assistance is the services that can help in getting back to your home with your vehicle. Basically, emergency roadside services include towing of vehicle but some of towing companies like Kwick Towing Inc also provide car battery boost, car locked out, on site fuel/gas delivery and tire change services. 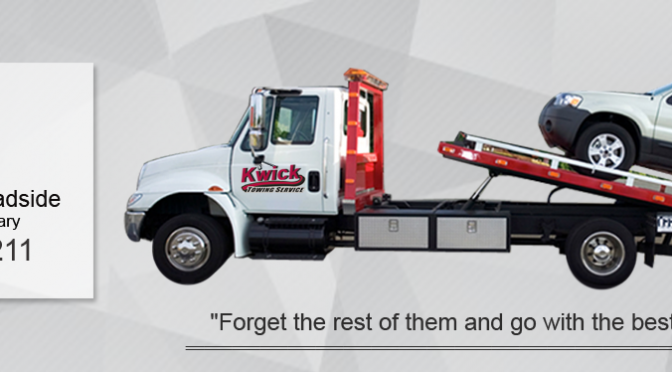 Kwick Towing Inc with his amazing crew of technicians and equipment provide you 24/7 hours emergency roadside services. We are the most trusted and rescue fleet in Calgary. Whether it is a vehicle locked condition or a road accident, whether it is heavy duty truck or a light weight car or bike, our team is able to handle all types of vehicle breakdowns. So, whenever your vehicle or car is broken down in Calgary or its surrounding areas, you may call Kwick Towing Inc at 403-542-9211. We ensure you that we will be there with in 15 to 20 minutes to assist you. No matter it is a middle of the night or a weekend. We are 24/7 hours available to serve you.